When I went vegan, one of the first no-bake dessert recipes I ever tried to make was cheesecake! Trust me when I say that I have experienced many fails with this, but luckily I've been able to nail the recipe and realise the do's and don'ts of no-bake cheesecakes! They're generally quite easy to make and only require you to blend the layers, press and pour them into your mould and of course set it in the fridge. Now as most of you may know, most no-bake cheesecakes are cashew-based. I've had some vegan no-bake cashew-based desserts that have been overly rich, sickening and hard to enjoy but the key to making this cheesecake delicious is ensuring the mixture is blended well (seriously though, who wants a gritty cheesecake?!) and using a range of other ingredients to help enhance the flavours (berries, coconut cream, lemon...). For this recipe I used small silicone moulds but feel free to pour into a regular cake tin! Creamy, sweet & tangy, these little bites of heaven are so delicious and leave you wanting more! 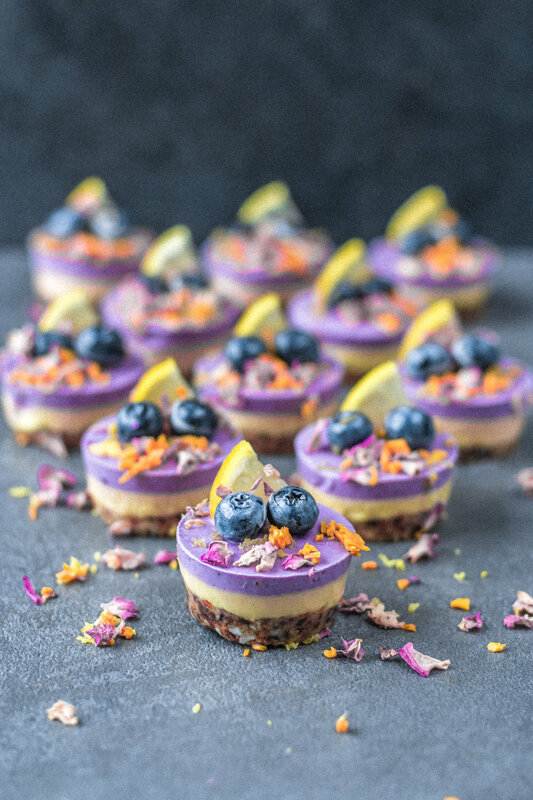 With a macadamia base, blueberry layer & mango layer, what more could you possibly ask for?! Add base ingredients into a blender or food processor and process until you end up with a crumbly mixture that sticks when pressed between your fingers. Press into the bottom of your mini cupcake moulds and pop into the freezer while you make the filling. Add cashews, coconut cream, maple syrup, lemon juice and lemon zest into a blender. Blend until smooth, lump-free and creamy. Pour out half of the mixture and set aside. Add the mangoes & a pinch of turmeric (for colour if desired) into the blender and blend until smooth. Pour into moulds and freeze for 1 hour or until set. Add the remaining batter back into the blender and blend with blueberries. Pour on top of the mango layer and return to the freezer to set. When set, pop out of the moulds and decorate however you like! Allow them to thaw at room temperature for 5-10 minutes before serving. * If using frozen (which is what I tend to use), thaw or even gently warm up beforehand. This is to make the blending process easier.